HERITAGE OPEN DAYS are held every year to enable people to see buildings which are normally closed to the public. Over eighty sites all over Greater Manchester opened their doors on Saturday and Sunday the 16th and 17th of September 2000. I'd love to have visited all of them, but time is limited and you need an hour or two for each one. Again and again we see how our local heritage, which in the sixties and seventies was under-appreciated and often left to rot, is at the turn of the millennium being reborn and celebrated for present and future generations. 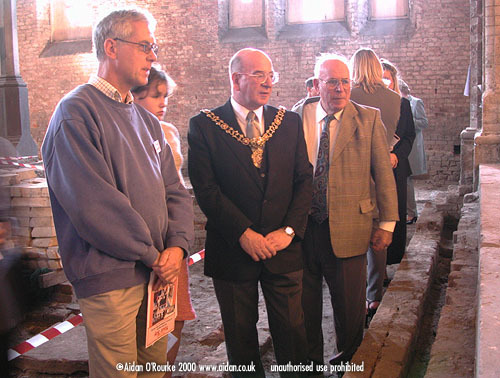 THE LORD MAYOR OF MANCHESTER, Councillor Hugh Barrett, visited Ancoats on the occasion of the Heritage Open Days on Saturday 16 September 2000. He was invited by Ancoats Buildings Preservation Trust. Eyewitness in Manchester had the honour of interviewing and photographing him. Here he is standing just outside Murrays Mill, on Murray Street. 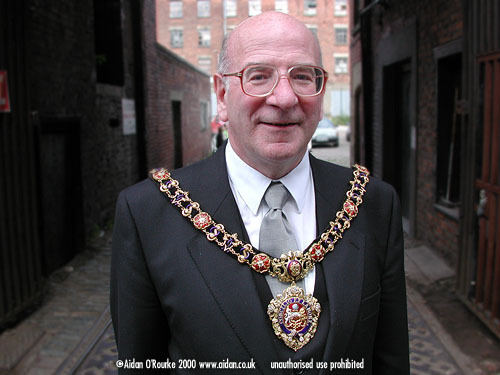 The Lord Mayor has many childhood associations with Ancoats, though his parental home was in nearby Ardwick. He began his career as a councillor when elected for the Ardwick ward on 23 October 1968. He represented Ardwick until 1994, when he was elected Councillor for Sharston, in Wythenshawe. Councillor Barrett manages to combine friendliness and a sense of humour with the dignity of his high office. In his talk to the members of Ancoats BPT, he remembered his childhood days, spent of the district, but also spoke out on the future of Ancoats: City centre apartments, he says, should be built for families, not just singles and couples. He has been Lord Mayor since 17 May 2000, and will remain in office until May 2001. 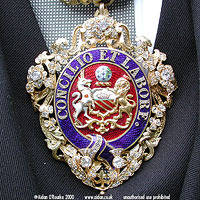 THE COAT OF ARMS of the City of Manchester is seen here inscribed on the medallion worn by the Lord Mayor on official occasions and visits. This particular medallion was made in 1855, and was presented on the visit of Queen Victoria. An inscription on the reverse bears witness to this fact. There are 169 jewels and it's made of 18 carat gold. Surrounding the central oval are the English rose, the Irish shamrock and at the bottom, the Scottish thistle. The Welsh leek is also visible. Inscribed on the belt, symbol of security, are the words "Concilio et labore", which the Lord Mayor translated for me as "Consider the action before you work at it", motto of the City of Manchester, still highly relevant today and not always observed by decision-makers in the Town Hall. The coat of arms shows a globe, symbolising Manchester's trade throughout the world, bees, signifying industry, and a ship, which reminds us that Manchester was a port even before the 1894 Ship Canal. The unicorn and lion are traditional heraldic symbols. Any more comments or information, please contact. 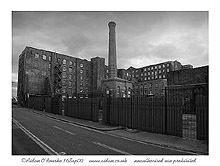 MURRAY'S MILLS, Ancoats can, according to local historian Steve Little, probably claim to be the oldest urban all-steam cotton mill in the world. Murray's first mill was built in 1798, and was subsequently added to, forming the complex of mill buildings we see here. The decline of the British textile industry began around the 1930's and continued in the post war years. Cotton spinning ceased here in 1959. 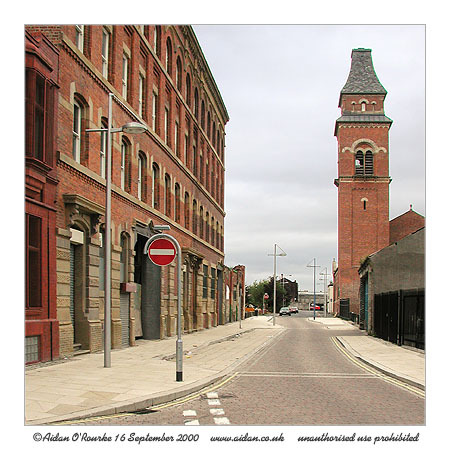 In the 70's, planners might have happily razed the mills of Ancoats to the ground and put up modern blocks in their place, but in recent years their priceless historical value has been recognised. They were listed Grade II* in 1989, which means they're designated as being architecturally significant and can't be pulled down. The buildings may look solid on the outside, but they need millions of pounds worth of renovation both outside and inside. 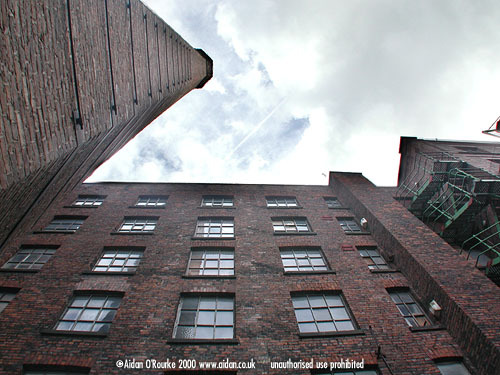 Fortunately over £5m of Lottery money has been secured by Ancoats Buildings Preservation Trust for the rescue of buildings in Ancoats, including these ones. In a few years if all goes to plan, they will house apartments and commercial properties - maybe I'll be living and working in one of them! MURRAY MILL is seen here looking up from the courtyard towards the sky. Everything we can see in this picture is original (apart from the burglar alarms). Metal bands securing the chimney also have steel bars to enable a steeplejack to climb up. The iron fire escapes on the right are also characteristic of industrial buildings I've seen in New York. What must it have been like for a nineteenth century mill worker to look up at the sky and see only grey clouds and smoke? THIS IS BLOSSOM STREET, Ancoats, as seen on 16 Sep 2000. The restored facade on the left has recently been unveiled. St Peters Church, with its renovated exterior and tower roof is further along the street on the right. The mid-Victorian character of the scene is however spoilt by contemporary additions. The street lights, showing the current fad for redundant design features - here an unnecessary diagonal support - are typical of a style which I've seen all over Europe. The 'wrap around' no entry sign makes an already intrusive piece of street furniture even more intrusive. In the 1950's, someone in the UK's Ministry of Transport came up with the idea of single and double yellow lines. Most other countries seem to be able to regulate parking without these road markings, which spoil many a Lake District or Cotswolds village. Here they are embedded in specially made setts, though the lines are narrower than normal. Eyewitness says: Restore the setts, flagstones and lampposts 'film-set-style' as closely as possible to their original state, using old photographs. ST PETERS CHURCH was built in the 1860's to serve the densely-populated industrial district of Ancoats. It survived for over a century but closed in the 1970's and was subsequently used for storage. Its condition deteriorated over time and it suffered vandalism and a fire in the tower. In 1996 was identified as 'a key historic building at risk of loss'. Ancoats Buildings Preservation Trust secured funding and the exterior was renovated. The interior remains an empty shell. 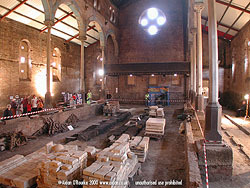 Here we see it open to the public on Saturday 16 September during the Heritage Open Days. In future, the building may become a centre for the arts or some other public use, or it may even be used as a church again. 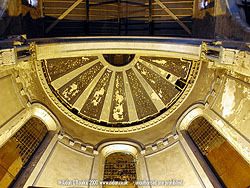 WE ARE INSIDE ST PETERS CHURCH, Ancoats, looking up at the roof of the apse. Much of the paintwork is peeling off, and many window panes are missing, but the essentials the church interior are still there. At the top of the picture we can see the temporary wooden roof. 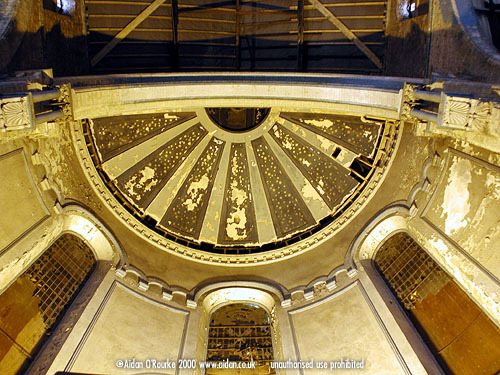 The curved plaster ceiling will be reinstalled as closely as possible to the original. What a shame this remarkable church was allowed to fall into decay in the first place. Thank goodness - thank Ancoats BPT! - it has been saved and will be used again by future generations. 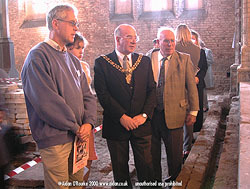 THE LORD MAYOR OF MANCHESTER, Councillor Hugh Barrett, visits St Peters Church, Ancoats on the occasion of the Heritage Open Days, 16 September 2000. He is looking at a slide show of old and new pictures of Ancoats, part of a visitors display set up by the Ancoats Buildings Preservation Trust.